lt;stronggt;SBWGP100lt;/stronggt;lt;BR/gt;Salter Brecknell Portable Electronic Utility Bench Scalelt;BR/gt;Portable bench scale which is designed for greater accuracy with attached handle. Weight hold key locks weight reading when a larger package blocks the display. Internal backlit display with four 1amp;quot; high LCD digits for easy visibility. Discreet keyboard technology. Electro-mechanic design. 22-gauge steel base. Auto-zero tracking and manual zero return. Programmable auto-shut-down. 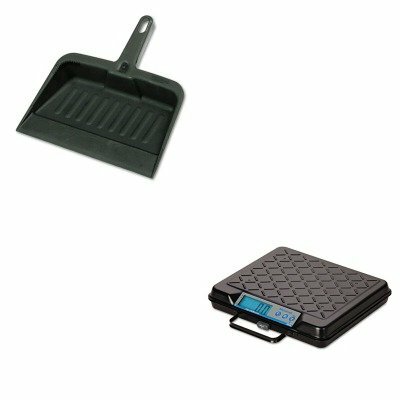 Scale Type: Utility Electronic/Mechanical: Electronic.lt;BR/gt;lt;BR/gt;lt;stronggt;RCP2005CHAlt;/stronggt;lt;BR/gt;Salter Brecknell Portable Electronic Utility Bench Scalelt;BR/gt;Handy dustpan features a tapered front edge to help simplify sweeping-up. Heavy-duty, moderately flexible plastic provides commercial-grade durability. Lanyard handle-hole allows you to hang and store the pan out of the way. Material(s): Polypropylene; Width: 8 1/4quot;. ~ Includes one dustpan.